A strong, UV stabilized door wheel. Looking for a strong and reliable caster wheel for your cattle crush? 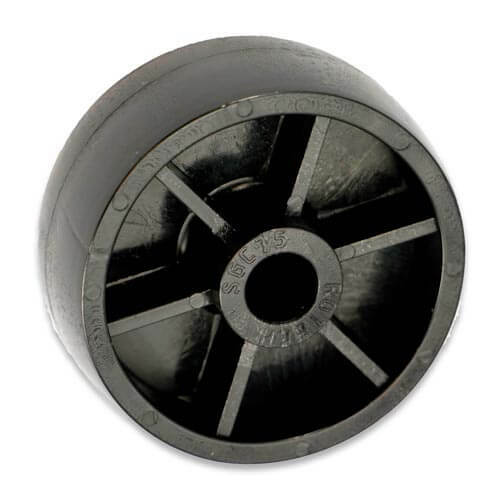 You can trust our acetal sliding gate wheels will last through years of solid use. Are you looking for a reliable and strong caster wheel that won't break on you? The last thing you want is to have difficulty closing your gate when you have a bull in your crush. We have designed a caster wheel that will retain it's shape over time, withstand the elements, and not crack. Each wheel is made from Acetal, for strength, and a UV stabilizing compound to ensure your wheel won't break down in the sun. We have also incorporated extra spokes in our wheel design to give extra strength to the wheel. *Recommended Retail Price. Prices do not include freight and GST costs. Acetal Plastic is among the strongest and stiffest thermoplastic available. It is well known for its longevity, low moisture sensitivity, and high resistance to solvents and chemicals. Our specialised mix, designed especially for Rotech, also incorporates a UV stabilizer so your wheels won't break down in the sun and crack. Have you ever left cattleyard crush unused for some time and return to find you get an uneven roll when you shut the gate? Nylon wheels can often warp when left in the same position for a long time, resulting a flat spot on the bottom of you Nylon wheel. This results in an uneven roll when you shut the gate. This is not the case with Acetal. Acetal is harder than Nylon, which means it won't warp when not in use. But it's not too hard. Ever moved your crush from one location to the other, only to discover your caster wheel has disintegrated? Often wheels made of harder plastic will shatter from all the vibration and movement of transportation. Not the case with Acetal. We've found the perfect mix of not to hard and not too soft to give you a high quality caster wheel that will keep its shape over time, last in any weather, and not shatter when transported. Interested in purchasing our products?